There are more than 17,000 species of orchids, one in nearly every color known to man. 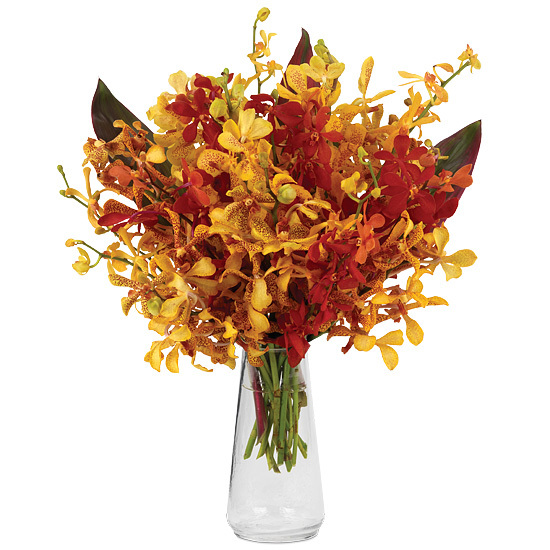 We sought out three that blaze like the sky at sunrise – bright yellow tiger tail arandas, speckled panee mokaras, and radiant red mokaras – and combined them with ruddy ti leaves to create this long-lasting bouquet. We paired these exquisite orchids’ of intriquing shapes with our tear drop signature glass vase. Trim stems 12” from the bottom of each spray by making a diagonal cut. Arrange orchids allowing them to fan out. Do not allow any blooms to be underwater. If you must, simply remove the blossom from the stem. Always add fresh water daily and mist your orchids. Trim away spent blossoms as your bouquet ages and rearrange. Typical orchid buds may gradually open at the tips of each stem, although most do not.